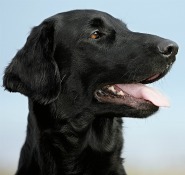 Malignant histiocytosis (MH) is an extremely aggressive form of cancer that, while rare in general, is quite common in a number of dog breeds – including Bernese Mountain Dogs, Flat Coated Retrievers, Golden Retrievers, and Rottweilers. Dogs who develop this type of cancer, which causes tumors to form throughout the body, often die within only a few months of diagnosis, and it is very difficult to treat. Because of its devastating effects on a number of highly loved dog breeds, the AKC Canine Health Foundation sponsors a great deal of research on the diagnosis and treatment of malignant histiocytosis. One such study, initiated by scientists at Colorado State University, has identified a potentially useful new therapeutic option – liposomal clondronate. Liposomal clondronate is a drug made by incorporating the bisphosphonate clondronate into liposomes –small spheres made of a synthetic version of the lipid bilayers that surround animal cells. This form of clondronate is highly selective for the phagocytic cells that are the scavengers of the immune system, the cells from which MH originates. Scientists had previously shown that liposomal clondronate was a safe and effective treatment for autoimmune hemolytic anemia in dogs. Since one of the ways it worked was to deplete the population of macrophages, which are one of the cell types that can mutate to become MH, researchers began to wonder if it might also be a useful therapeutic option for dogs with MH. Their curiosity was also fueled by the fact that, for many years, liposomal clondronate has also been used to get rid of macrophages in mice. Early evidence looks promising. When the Colorado scientists tested the drug in cell cultures derived from both MH tumors and non-MH tumors, they found that liposomal clondronate did a great job of specifically targeting the phagocytic MH tumor cells for killing. However, the effectiveness with which it killed MH tumor cells varied by tumor cell line, something that was not unexpected, since these cancers show significant variability from dog to dog. That’s why, following those in vitro results, it wasn’t surprising that the effect of liposomal clodronate varied when the scientists attempted to treat five dogs with MH. What was surprising was how well the medication worked in two of the animals. It successfully caused the regression of tumors where previous treatments had failed – a very promising beginning. Liposomal clondronate may not be the magic bullet that gets rid of malignant histiocytosis, but the study by Scott Hafeman and his colleagues clearly demonstrates that it’s a treatment worthy of more study. Even if the drug could only help a fraction of the dogs affected by MH, it would be a beacon of hope for the many dog owners who have lost beloved animals to this disease. This work was funded by AKC Canine Health Foundation Grant 1472. Meet Malibu, a white shepherd, who was picture-perfect at six weeks of age when she was adopted by her family. Energetic, with a zest for chasing after and jumping for her toy ball, “Boo” thrived on being active. Fast forward nine years. It’s 2008 and age has taken its toll. Boo has great difficulty standing up and struggles to walk to her dog bed. She limps painfully and her back arches, bracing from the pain of severe arthritis in her hips. Boo wasn’t responding significantly to traditional anti-inflammatory treatment for her arthritis. Her owners, Steve and Sheila Sweitzer, were worried about her quality of life. But, they discovered there was a new option for Boo: Stem cell regenerative treatment surgery. This revolutionary treatment for dogs can help—but pet owners should be financially prepared. The average cost for stem cell treatment for a dog costs approximately $2,500. Stem cells hold immense promise for medical treatment because they can take on the traits of all kinds of cells and then replicate many times over. But they’re also the subject of fierce controversy because the most versatile cells can only be derived from embryos. But what if you can utilize stem cells found in your own body? Not only is it possible, it’s also proven to be effective in animals. Vet-Stem Regenerative Veterinary Medicine in San Diego, Calif., has spent the past 20 years developing a successful stem cell treatment for animals. Vet-Stem CEO and founder Robert Harmon says that during their development phase Vet-Stems treated nearly 3,000 horses, many with joint problems. One of those, a race horse named Be A Bono had bone chips and fluid buildup in his knees that threatened to end his prize-winning career—and his life. After receiving stem cell treatment, Be A Bono returned to the race track and has since earned more than $1.25 million in prize money. Word of Vet-Stem’s success got around and people began to ask if the treatment would work on dogs. According to Vet-Stem, canine patients show significant improvement about 70% of the time. How Does Stem Cell Treatment Work for Dogs? The ideal candidate for stem cell treatment is a dog in otherwise good health that suffers from arthritis or hip dysplasia but doesn’t respond well to the typical medication. The first step in a dog’s stem cell treatment is collecting fat cells from the dog’s body. The regenerative cells that are collected do several things: They release chemicals that help decrease inflammation; they send out chemicals to the body to bring healing cells into that area; and they have the potential to regenerate damaged tissue—in other words, nearly reproducing tissue as it was at a younger stage. One other important factor: These are not synthetic cells being replaced into dogs, they’re their own natural healing cells so there is less chance of rejection or interaction and there are potentially fewer side effects. Boo underwent general anesthesia to have about 30 grams of fat cells removed from her abdomen. These fat cells were then shipped to the Vet-Stem labs where the cells were isolated and then sent back to Boo’s veterinarian within 48 hours. Under local anesthesia, the cells were then re-injected back into Boo’s arthritic hips in greater concentration than her own body could’ve accomplished. Within one week of her stem cell injection, Steve and Sheila noticed a shift in Boo’s behavior. Boo went back to running in the backyard, even jumping up to catch her ball. During Boo’s procedure in 2008, the Sweitzers stored an extra set of the dog’s cells for future use and, according to Steve, they’ll likely be put to good use in the near future. To see Boo in action, and learn more about her procedure, watch her video.